Last week, the Oakland Unified School District's board didn't muster enough votes to renew the charter petition for Amethods Oakland Charter Academy, one of the city's many charter schools. Only three board members of the seven member board voted in favor of renewal — Aimee Eng, James Harris, and Jumoke Hinton-Hodge. One board member was absent (Roseann Torres), one abstained (Nina Senn), and two voted no — Jody London and Shanthi Gonzales. 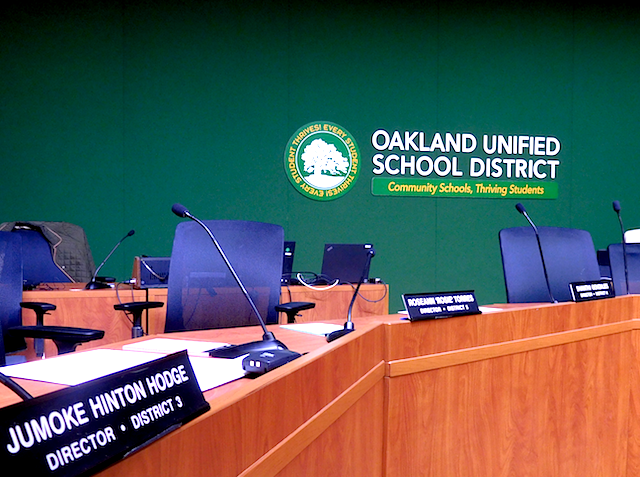 Immediately after last week's vote, an OUSD staff member explained to the board that the renewal failed and the Express reported the district staff's initial determination. Amethods staff responded to the vote with disappointment. But under state law, three out of seven votes is enough to renew a charter school's right to operate, according to OUSD officials. "The confusion came after it became clear that the vote did not count because, by statute, the Board of Directors must pass any motion with four yes votes, not three," explained OUSD spokesman John Sasaki. "But this did not mean that OCA’s renewal was denied because there was no motion to deny, only a motion to approve." In other words, the vote was virtually the same as the board taking no action on the proposal to renew OCA's charter. And state law says that if a district takes no action within 60 days of a submission of a renewal petition to approve or deny a charter school's right to continue operating, then it's automatically approved.